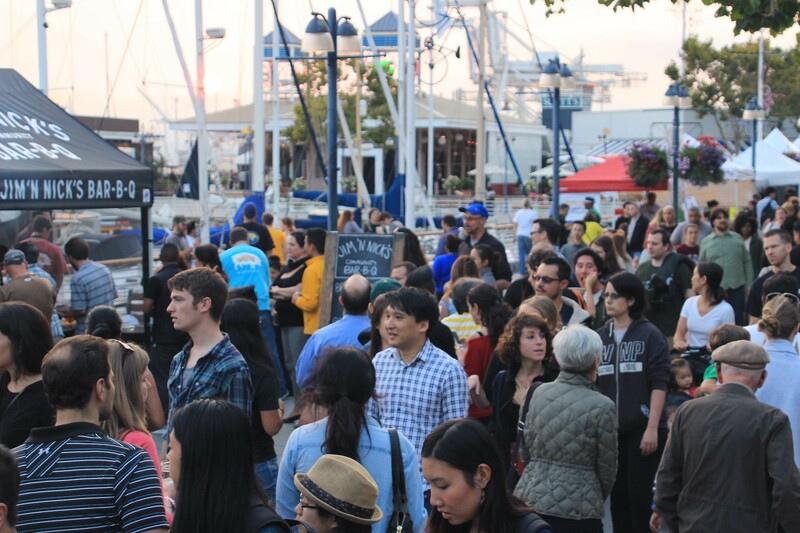 Last year's Eat Real Festival brought hundreds of thousands of visitors to Jack London Square. 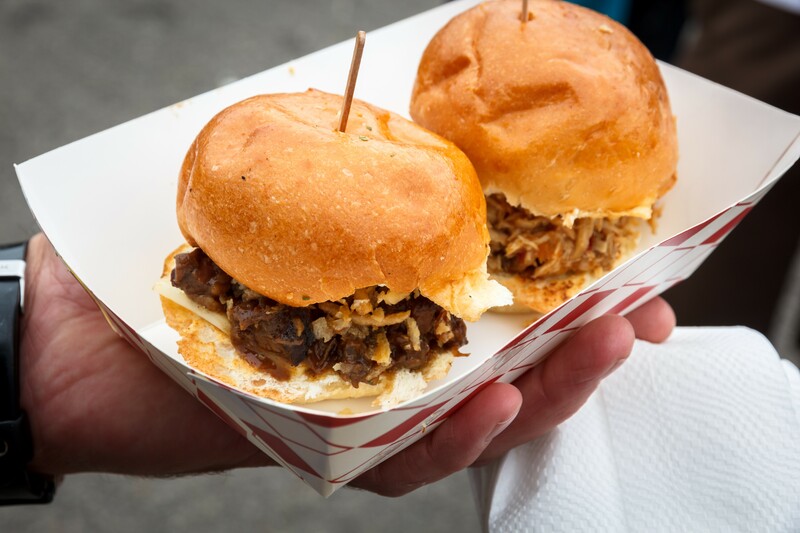 When Oakland’s Eat Real Festival made its debut in 2009, gourmet street food was still somewhat of a novelty in the Bay Area, and the national media was still several years away from deigning to recognize Oakland as a world-class food destination. Now in its seventh year, Eat Real simply feels like an inevitability. The sprawling three-day street food festival will take over Jack London Square again this weekend, with a lineup of eighty-plus food and beverage vendors — about a quarter of them making their first Eat Real appearance, according to Ally DeArman, director of the nonprofit Food Craft Institute that organizes the event. The festival kicks off on Friday, September 18 and will run from 1 to 9 p.m. on Friday, 10:30 a.m. to 9 p.m. on Saturday, and 10:30 a.m. to 5 p.m. on Sunday. Admission is free, and the price for all food items will be capped at $8. Given that there appears to be no end in sight to California’s extended drought, it makes sense for a food festival to give the topic some attention. This year’s edition of Eat Real will have several “DIY DRY” demos, including tips on water-wise gardening (courtesy of Jack London Square newcomer Sunset Magazine) and cooking demos that will feature drought-tolerant legumes. In addition, the Belcampo Meat Co. booth will sell burgers made with beef from organic dairy cows all weekend long — a burgeoning trend in the beef industry, because it’s more environmentally friendly, since the same amount of water can go toward producing both beef and milk instead of just beef alone. Before the festival itself starts, fans of the reality show Shark Tank may want to check out the Food Craft Institute’s FOOD.FUND.FEST kickoff event on Thursday, 6:30–9:30 p.m., during which five relatively new food entrepreneurs will pitch a panel of “Slow Money” local food system investor types. DeArman said the event would be like Shark Tank without the “sink or swim” element. That said, only one competitor will win a $1,500 cash prize. Tickets are $10, plus an optional donation that will go toward sweetening the reward pot. On Friday, several Oakland chefs, including Juhu Beach Club’s Preeti Mistry and Cosecha’s Dominica Rice-Cisneros, will do a series of cooking demonstrations focused on the theme of global fast food — no Big Macs, then, but rather Indian chaat and Mexican street tacos. For the past few years, Chico-based pork purveyor Rancho Llano Seco has run “Offal Wonderful” as a parallel event on the Saturday and Sunday of Eat Real. This year’s theme is “Skin and Fat,” which provides a dual benefit to festival attendees: First, ambitious home cooks can check out chef demos for dishes such as lard biscuits and pork skin chorizo. More importantly, the promotion is designed to build demand for less popular cuts — in this case, the skin and fat — on the part of both chefs and customers. If that happens, pork-fat enthusiasts will find that Bay Area menus might start to get a little more lard-y. Check out the Eat Real website for additional details, including a map and full schedule of events.